Marla Stewart Konrad is keenly interested in global issues and has a special concern for the well-being of children. Her career as a speechwriter and communications professional has taken her to numerous countries in Asia and Africa. She lives near Toronto, Canada, with her family, and is the author of several books for children. I thoroughly enjoyed this book. The pictures are delightful and the repetitive story is perfect for toddlers. 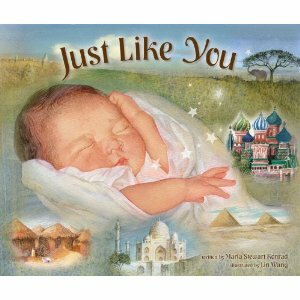 As each page turns a different children from around the world is revealed on the day he or she was born. We meet the child and the customs and cultures of the family, learning how very different we all are, and how very much the same. This is a delightful read and I whole-heartedly recommend it for children of all ages. Awwwww… that sounds like a great book!